You are here: Home / Ethnic Groups / The People of Sulawesi / Who are the Kulisusu? The Kulisusu people live in the northeastern area of Buton Island, in the province of Southeast Sulawesi. The Kulisusu live on the narrow hilly peninsula which juts southward separating the Koro Bay on the west from the Banda Sea on the east, an area approximately 5 km in breadth and 20 km in length. Although little has been written about the Kulisusu, we know they have been in their present location for at least 400 years. While they have always been a small people group, they enjoyed a period of independence in the early 17th century until their capital was sacked by force from the Ternate people (from North Maluku province). Because of the continuing threat from Ternate, the Kulisusu found it best to align themselves as a vassal state under the neighboring Wolio people, whose sultans ruled from the southern part of Buton island. The Kulisusu language is part of a larger language group called the Eastern Bungku-Tolaki which also includes the Wawonii, Tolaki and Waru languages. Most Kulisusu families have their own farmland and work together in cultivating the land. They primarily cultivate cassava, corn and rice along with assorted vegetables and fruits. In addition to personal consumption, produce is also sold in the markets. The Kulisusu are known for offering low prices. Some Kulisusu are traders who travel to other islands in and around Indonesia or work on merchant ships. Kulisusu who become government employees are respected by others, because of their prestige, high salary and opportunities to improve their lives. Northern Buton has recently become its own district, which has brought more government jobs to the area. Because of the strong extended families of the Kulisusu, each working adult will share at least a part of his/her salary with the larger family. Honesty and hard work are valued among the Kulisusu people, and they have an extremely low crime rate. The Kulisusu are followers of Islam, which came into their area around the 17th century. The Islamic faith is expressed through activities such as circumcision, attending the mosque, and fasting during the month of Ramadan. The end of Ramadan marks the beginning of unique Kulisusu celebrations. 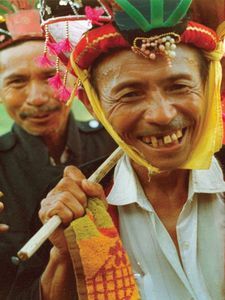 The Kulisusu’s Islamic identity does not prevent them from having special celebrations to satisfy evil spirits, or going to a dukun (shaman) when they are sick or having difficulties. Because the Kulisusu land is rocky, they cannot grow easily marketable plants that are well known in other areas of Sulawesi. Inexpensive medical care and medicine are needed in rural areas. Because of financial obstacles and other factors, the Kulisusu only seek medical help in cases of emergency.